Driver and API support for QNX 6.x is offered for the PROFINET boards CP1604, CP1616 from Siemens , and the onboard CP1616 interface of the MicroBox II. 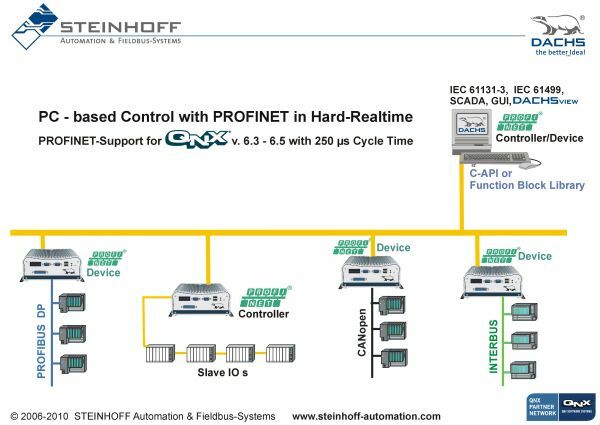 The C-API as well as the function block library are fully compatible with the PNIO API defined by Siemens! The operation modes RT and IRT are supported for QNX 6.3.2 up to QNX 6.6 with a cycle time of 250 µs. The configuration of the CP16xx Masters and its networks must be done by the SIMATIC NCM PC configuration tool.